At PDC 2008 we got a nice Freescale JM badge board to test with Windows 7 and its Sensor API. I definitely wanted to try it, but didn't have the luxury to re-pave a machine just for this. 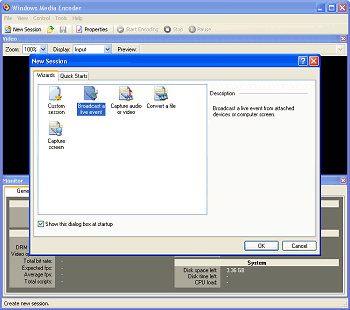 VirtualPC doesn't support USB (a lack that annoys me immensely, not only now, but also for Windows Mobile development), so I had to look for another option: VirtualBox. It supports USB. I decided to give it a try (VMware was on my list too, but when I saw their registration requirement for a trial version I balked). The additions are required, otherwise no USB support (or easy network, but you could work around that one via emulating a different NIC). 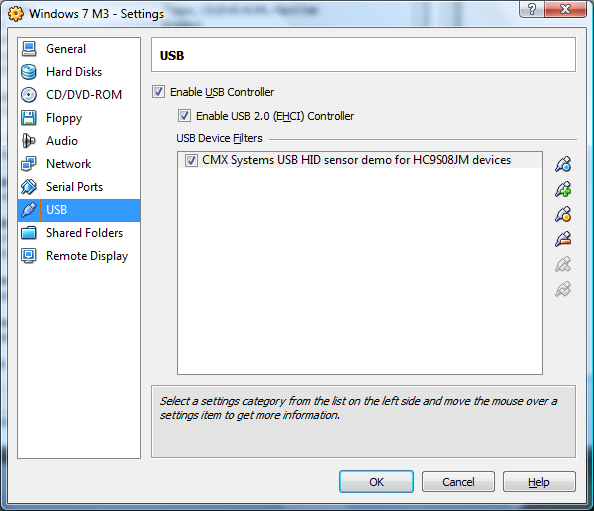 The "CMX Systems USB HID sensor demo for HC9S08JM devices" is what you are looking for. At least that's what Vista calls the device. 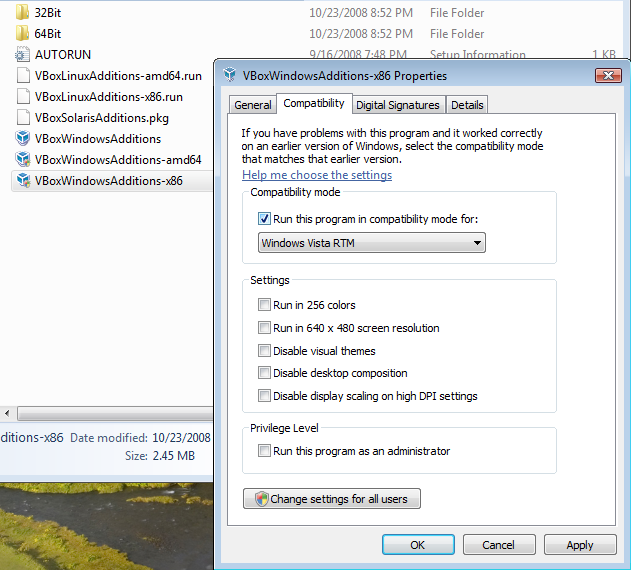 Now all you need to do is boot up your Windows 7 VM again and install the SDK from the supplied disc. Note that I achieved the best results by following the guideline at the end of the document entitled "Sensor Development Kit Driver and Firmware.rtf", to be found in the Documentation folder. By the way, there is a MSDN forum Development with the Windows Sensor and Location Platform just for this topic. If you don't know what I was talking about, check out the session recording Windows 7: The Sensor and Location Platform: Building Context-Aware Applications. I was rather disappointed this year by the varied quality of the sessions, plus the not-so-matching session descriptions / session levels. Tuesday June 19th I will be doing two sessions on IIS7 - administration and programmability. The dud-of-the-week award goes to IAM403 which didn't live up to its level. Enjoyable as ever was Steve Riley in his security sessions. I didn't get around to watch "Windows Vista User Account Internals" by Mark Russinovich because of ATE duty, but will do so once the conference DVDs turn up in mail! Another noteable tidbit from the "Achieving High Availability with SQL Server 2005" preconference session: the whitepaper Partitioned Tables and Indexes in SQL Server 2005. Currently listening to the half-day preconference session "Achieving High Availability with SQL Server 2005" by Kimberly Tripp. Interesting tidbit for decreasing downtime for operational tasks (like create database or restore): Instant File Initialization. The figures really point to huge time savings! Quite a selling point for Enterprise Edition of SQL Server. It's two weeks in Barcelona for me - and for IT Forum, I am really doing ask-the-experts for Visual Studio Team System! The only session to be rated "eminently forgettable" was DEV322. Well, at least I got to read my emails... The top-rated session definitely was Bob Beauchemin's SQL402, which kind of was an interesting session to go to before ARC304. Great fun was Rob Miles' XNA talk (this session doesn't fit the pattern of my interest, does it?). There are a couple of sessions I missed, but I'll watch those once the post-conference DVDs have landed. From the nuggets page: Don't have the time to read a 10-page how-to article or watch a full length webcast? Try an MSDN Nugget, a webcast that takes you step-by-step to discovering new functionality or exploring a hot developer topic, all in 10-15 minutes. If you haven't seen this yet, check it out! Today, Daniel held a talk comparing AJAX frameworks for ASP.NET. He limited the scope to indirect frameworks, which means: those AJAX frameworks extend ASP.NET, and you don't necessarily need to know much about AJAX. On his Web site, you will find a comparison of AJAX frameworks for ASP.NET (direct as well as indirect). Hope you will find those useful. Half an hour ago, I completed my talk "Windows Workflow Foundation & ASP.NET 2.0". As promised, here is the list of links to sites / documents that I used to prepare this talk & accompanying samples. Also, see my last post on ASP.NET PageFlow CTP. This was the last part on "future technologies". In less than ten days, this year's ASP Konferenz will take place in Burghausen, Germany. This time, I will be presenting four topics: Windows Workflow Foundation & ASP.NET 2.0, Build Providers in ASP.NET 2.0, IIS 6.0 & ASP.NET 2.0 Secure Deployment and finally Health Monitoring in ASP.NET 2.0. Next week, I am doing the first in a series of security on-site briefings for Microsoft Austria. 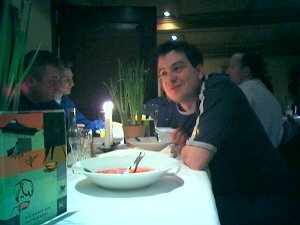 Mario has blogged about our TTT event in two entries Security Technical Briefings - Train-The-Trainer... a looong evening (Part 1) and Security Technical Briefings - Part 2. Thanks to the workshop character, no two briefings will be alike. Next week, I will be in Rosenheim, Germany for the ADC 2005. 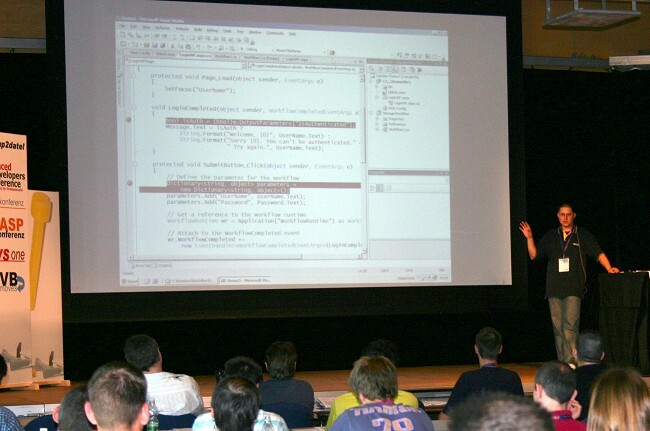 I'll be teaching the Visual Studio 2005 Team System Hands-on workshop (Tuesday as well as Friday), plus doing two talks during the main conference: IIS 7 and ASP.NET 2.0 Health Monitoring. See you there! Threat Modeling We got that book during Monday's Attack and Defense preconference session. Free, of course. Coder to Developer That was on my list for a (too) long time. Presenting Windows Workflow Foundation I didn't make it to any of the giveaway sessions, so I bought a copy. Visual Studio Tools for Office Since I saw VSTO 2005 for the first time at an event in Redmond this year, I was looking forward to playing with it. Here's my ticket. The best of Verity Stob Special thanks to Gary Cornell from Apress for giving me a free copy! A real classic. Shame on you if you don't know Verity Stob, however, about everyone I told about the book so far was like "Verity Who?". You're definitely reading the wrong rags. The conference is over, and my brain is full - full of (semi)stupid ideas what I'd like to try with all those new technologies I saw this week. Task #1 for next week is to set up a VPC with Whidbey Beta 2, because I no longer have such an image, but need it for LINQ, Atlas et al. So plenty of good reasons to go back in time. Do you support stored procedures? Do you support database xyz? For #1, this is an unqualified yes. For #2, a provider needs to be written. And last but not least: at runtime, you only incur conversion to SQL, and the generation of objects. So no significant hit should be expected. The day started out with one of those famous spoof videos - this time about a "variation" of Windows error reporting, dubbed WE-SYP (we share your pain). Error reporting tied to a - let's call it - "multimedia" chair. Fun to watch. Right after that, Bob Muglia showed off what we can expect from Windows Server in the next couple of year. Windows Server 2003 Compute Cluster Solution was demoed together with Excel Services - impressive. TxF (transactional NTFS) wasn't any less exciting, just like the identity solutions - and, of course, IIS 7.0. We got the bits for the latter today. The under the hood session for Longhorn server had one interesting tidbit - they aim to require mandatory signing for kernel mode drivers on x64 platforms - bye bye kernel root kits! Bradley Millington quite overshot his allocated timeslot for the ObjectDataSource control, but he covered interesting areas: filtering and master details, custom sorting and paging, updates inserts deletes as well as transactions and caching. Seeing realistic examples is a welcome change. A good place for you to start: the Advanced Data Scenarios section of the Quickstarts. (Note: those links point to http://beta.asp.net, and I don't think that Whidbey docs will be up and running there forever, given that "Orcas" starts appearing on the horizon). Today's first keynote speaker was Eric Rudder. He unveiled the Expression Suite, which contains Acrylic, Quartz and Sparkle. For the latter, go to Channel 9 and watch this video. Also, the Windows Workflow Foundation saw the light of day during the keynote, as well as (last but not least) VSTA (Visual Studio Tools for Applications). You can learn more about VSTA in this blog post. Eric was followed by Steven Sinofsky, who focused on Office 12. He demoed SharePoint, InfoPath, the new Access and more. I have to say again what I said previously - this is the first time I'm interested in an Office beta program. 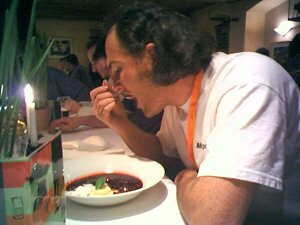 Good news is that all PDC attendees are signed up, steak knives being strictly optional <g /> (and even more limited than that phone fiasco from day one, 'nough said). Wow - my sixth PDC. Want to know what Atlas is all about? 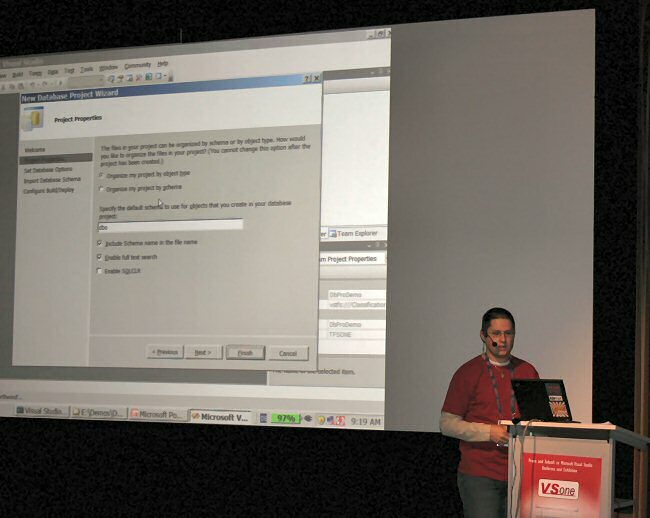 On the Atlas site you will find hands-on labs, live quickstarts demoing Atlas features, documentation, and VSIs for creating your own Atlas apps with Visual Studio 2005. What are you waiting for? Check it out now! The PDC today officially kicked off with a keynote by Bill Gates. To me, the more interesting parts came later in Jim Allchins keynote: Atlas, Windows Communication Foundation, Windows Presentation Foundation as well as C# 3.0 & LINQ. However, Office 12 does look very promising too. Can't wait to get my hands on that beta (never expected to say that about Office, ever). Looking forward to tomorrow, because Windows Workflow Foundation will be revealed at the keynote (aka general session). Today was preconference day at the PDC. I opted for Keith Brown's talk Attack and Defense: The Art of Secure Coding. Of course it contained a couple of well-known "friends" such as SQL Injection, but there were other interesting tidbits that made it worthwhile. Definitely worth checking out, might save a headache or two when using those tools. Keith also briefly discussed SDL (Security Development Lifecycle) vs Security Engineering Guidelines. You could also cast that as ideal world (ie lots of cash for security available) vs real world. Therefore: go for patterns & practices stuff to make your projects secure. If there's one thing I could do without then it is travel, especially when you fly in from Europe. 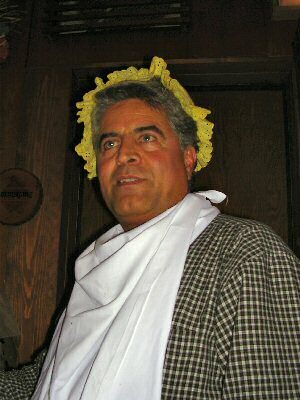 But PDCs have always been worth it - I attended every single one since the ´96 PDC "Building Internet Applications" in SF. Funny enough, I still have the tote bag from that conference, and it made to this years PDC (again, the bag is a frequent traveller in its own respect). The most durable and useful product I ever got from MS <g />. No patches applied so far. I spent a good portion of the twelve hour flight watching the 2.2 gig Channel 9 videos I brought with me on the plane. It pays off to have two spare batteries for your laptop (did I mention that I really, really like my X31?). I did resist using the Connexion WLAN that was available on this flight. Somebody else couldn't. Back to PDCs, especially this year's. Originally, I had planned to pay a visit to the Mono user meeting on Tuesday night, however, they scheduled it during the expo hall reception. In a hotel away from the conferene center. Too bad. Hot off the press: on 8th of September, I will be doing a rerun of my TechTalk Tools zu erfolgreichen Softwareentwicklung mit .NET (~ Tools for successful software projects in .NET) in Graz at the monthly .NET User Group Styria meeting (sign up here). So if you didn't have a chance to attend my TechTalk in Germany, this is your ticket in Austria. That's it. You might also want to check out my link list for last week's webcast, Profiling for Visual Studio 2005 Team Systems Beta Experience. That should get you started with profiling. Next week's topic is "The build system of Visual Studio Team System". Go here, and download samples, slides, and for almost all sessions, actually watch it! Especially interesting might be this one here: WEB340 IIS7: Discover and Move to the Next Generation Web Application Server Platform. The registration for this year's .NET Community Conference in Austria went live today (register here, it's free). The thread of this years rendition is security: threat modeling, .NET 2.0 security features, SQL Server 2005 security and more. Definitely worth your time, if you have time to spare, join us on 12th of August in Vienna! Fun with callbacks Part 1: What's in the ASP.NET box? Fun with callbacks Part 4: What about postback events? Of course we did labs on CallbackProxy and RefreshPanel, the latter one is described in this blog entry (again, a streamlined version of the lab done by Alexander Schoeppl). First, copy RefreshPanel.dll to the \bin directory of your site. You can get it here. 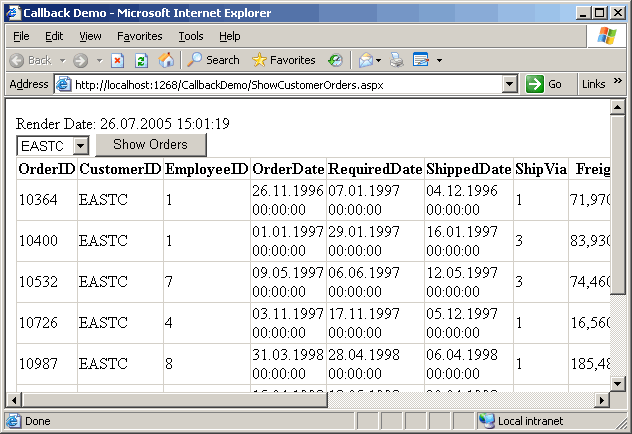 Register imports the RefreshPanel control suite for us, the Label and DropDown are also very straightforward. The RefreshPanel control itself contains a single GridView control, and it is linked to the server-side method FillData which we will examine in the next step. The RefreshButton is responsible for activating the out of band call back to the server - that's also where we get the value from the dropdown control, and pass it as an event argument to FillData. Note that the control names are hardcoded, in the real world we'd build that string dynamically, because otherwise we'd get into trouble, eg with master pages. No magic in our code, but: RefreshPanel takes care of giving us a GridView control to work with, and shipping the resulting HTML to the client - and inserting it into the page. Very, very neat indeed. Stefan Schackow (PM ASP.NET team) just demoed this cool little application here at the chalk & talk session @ TechEd in Amsterdam. The really interesting part is how to flow authentication information such as username and roles securely to the ASP application. The German .NET community's July event, the ASP.NET 2.0 Community Boot Camp aka CBC05 is now fully booked! It feels absolutely great that we (speakers are almost exclusively MVPs) were able to organize a five day training event on ASP.NET 2.0 by the community for the community. See you in Bad Ischl in July! Finally, everything for my (German) TechTalk Tools zur erfolgreichen Softwareentwicklung mit .NET is online on the TechTalk site: slides, demo and links document. 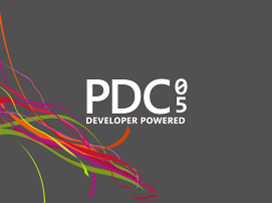 Just registered for PDC05. I will be in LA Sun-Sun, and attending the black belt security preconference session on Monday, which I consider a must - especially given that Michael Howard is one of the presenters. This Thursday afternoon I attended the rerun of the VSTO session (Microsoft Visual Studio Tools for Microsoft Office System - quite a mouthfull, I'll stick with VSTO) in the Smart Client track (my main track was VSTE - Visual Studio Team Edition). Wow! The 2003 version didn't impress me at all when I saw it back then. But 2005 really rocks. Catherine Heller (Technical Evangelist) did a nice demo in Excel. The way the document is design- and programmable, access to the action pane and rolling your own smart tags is almost too easy. Forget about VBA, serious Office development is now on the horizon. Next week I will be attending a four day Whidbey training on campus with focus on Visual Studio Team System. Not exactly looking forward to yet another long flight though. The TechTalk I will be doing in June has been announced on the msdn TechTalk developer portal (German). Locations and dates are yet to be announced, thus no registration so far. The topic will be "Tools for successful software projects in .NET". 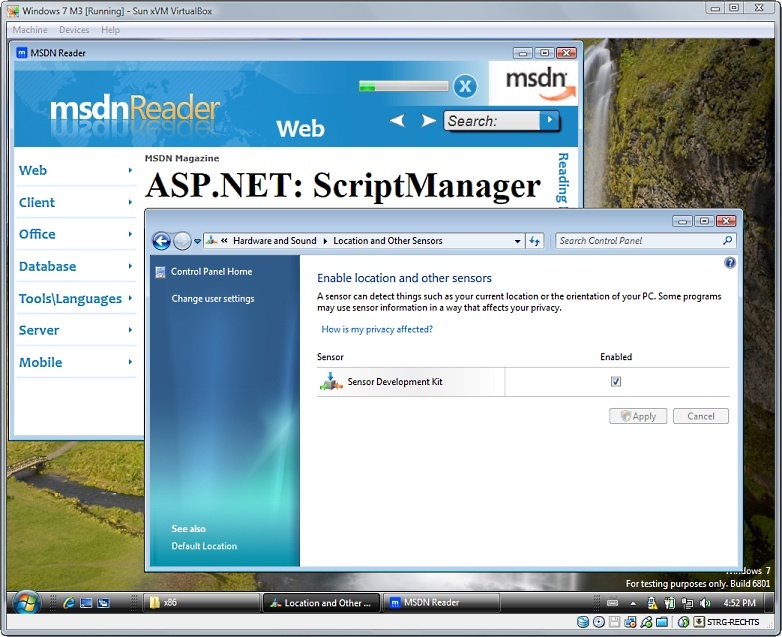 Once again working on my backlog... interested in ASP.NET 2.0? Then watch the videos on this page. Jeff Prosise talks about Web Forms, State Management, Security, Master Pages and Site Navigation, Data Access as well as Application Infrastructure. The past three days I attended the ASP / vs2005 conferences in Munich as a speaker (not including today of course, which was spent in sunshine on the slopes of the ski resort Dachstein West, gorgeous powder included after the snowfalls of last week). As advertised, my talks were about (near) future technologies: ASP.NET 2.0 Master Pages & Themes, ASP.NET 2.0 Membership & Security as well as a crash dive of VSTS Team Developer, with demo focus on Unit Testing, TDD, Code Coverage as well as Profiling. I brought back a couple of fotos, the first two are (of course) self promotion - myself in talk #1 and #2. Thursday evening the speakers were invited to a "VIP Dinner", and I couldn't resist to test my SPV C500 camera in low-light conditions. It did fare fairly well if subjects did not move. 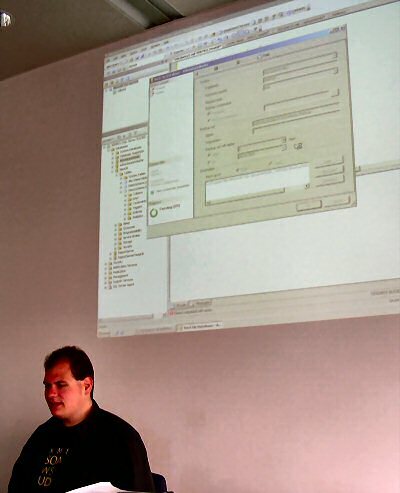 Last week I did a three day course for Peter's Sql Server User Group Austria (SSUGA). The reason it is part of the Summer Academy is that it originally was scheduled for summer, but I got the slot which ended up colliding with about everybody's holiday plans - so we decided to reschedule, and last week it finally happened (right smack when the snowfalls started... so much for the title). "Dieser Kurs richtet sich an professionelle Entwickler die für das Design und die Entwicklung von Daten-zentrierten, verteilten Applikationen verantwortlich sind. Teilnehmer haben bereits Erfahrung mit Visual Studio .NET 2003, bevorzugt im Bereich der Webapplikationsentwicklung. Die Kursbeispiele werden in C# präsentiert, die verwendete Datenbank ist die MSDE. In diesem Kurs werden disconnected (DataSet) als auch connected Szenarien des ADO.NET Datenbankzugriff-APIs behandelt. Ebenso kommt XML Integration nicht zu kurz, Data Binding, Transaktionen sowie architekturelle Themen. In this session you will learn how to take advantage of the combined power of Visual Studio, the Microsoft Office System, and industry proven practices to successfully manage software projects—from conception to deployment. This session introduces the new Team Foundation Server in Visual Studio 2005, including the new Source Code Control, Work Item Tracking and Team Portal. See how an integrated and extensible server-based system will boost your team’s productivity by significantly streamlining your development processes. Bijan Javidi, Senior Principal Consultant at Microsoft, held a two-day Trainer the Trainer (TTT) event in Augsburg for the GLS Development Process Best Practice training. In the audience: Alexander Zeitler, Peter Koen (soon to be Softie), Bernhard Spuida, Hannes Preishuber, Achim Oellers and others (no specific order, just to name a few). Let's start with "Why Development Process?" Bascically we are talking initialization, analysis, design, implementation and deployment. And that was then the contents of the two-day workshop in Augsburg. Aside from just watching, I did the workshop part for SQLCLR features - writing functions, stored procedures, UDTs (user-defined datatypes), aggregates and triggers in .NET code. 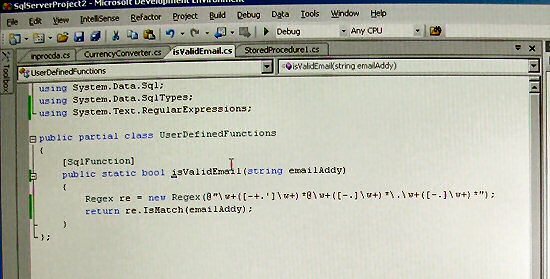 One cool sample is a function for email verification - try to do this in TSQL! "Willkommen in der PowerPoint-freien Zone! Dieser Vortrag ist 100% Hands-On zum Thema "Was ist neu in VS.NET 2005" - also nicht Framework Features sondern (neue) IDE-Features ist der Inhalt dieses Talks. Von Refactoring zu Debugging, Klassendesigner und IntelliSense und vielen anderen Verbesserungen im Bereich des Editing und der Unterstützung durch Tools. " 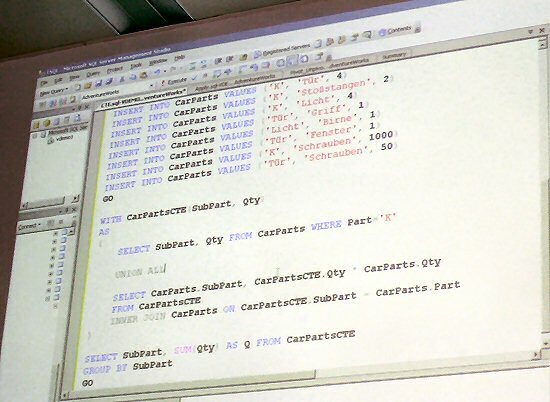 Peter coaxed me into doing a three-day course on ADO.NET for his local SQL Server User Group in Vienna, Austria. This summer academy offers five courses in total, ranging from T-SQL programming to MDX, from ADO.NET 1.1 to a hands-on lab for SQL Server 2005. Let's see how much I can cram into my course - I plan on covering the .NET Data Access Architecture Guide, Designing Data Tier Components and Passing Data Through Tiers, DAAB 3.1, SQL Server Centric .NET Code Generator (a really cool tool by Pascal Belaud) and maybe even get around to introducing the Provider Model Design Pattern and Specification (and part II).